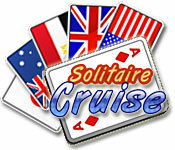 Solitaire Cruise is rated 4.3 out of 5 by 4. Rated 5 out of 5 by califnana from Fuzzywashe Nice calm game, one to relax with. Rated 4 out of 5 by mrm2006 from Around The World .......................... In How Many Hands? Solitaire hands that is. Storyline: You are taking a cruise around the world. You are able to disembark at each port and go see the major sites. Enjoy. Graphics: Okay. Nothing special. Was interesting when you changed countries (every 6 completed levels) that the card backs were that particular country's flag. Very nice touch. Sound: Again, nice touch that each country you visited was matched with music familiar to that particular country. Game Play: Not your typical solitaire game. This is a matching of the pairs game. Not difficult at all. 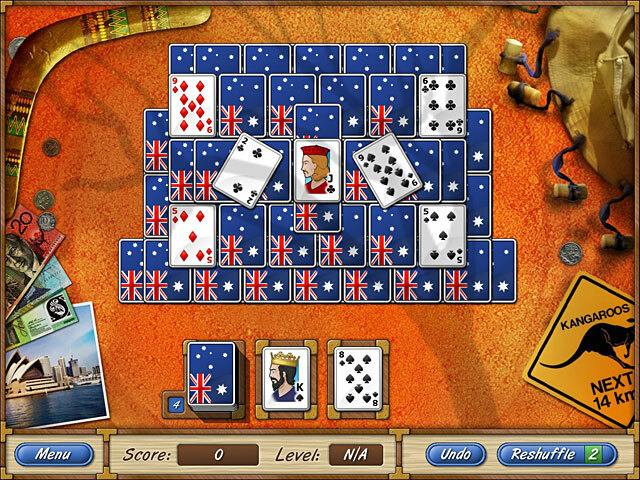 The layouts of the cards were conducive to the sites you would see in the particular country you were docked at. Also, nice touch. Every country had 6 sites/levels that you had to pass in order to proceed to the next country. This Glam-ma was not overly amazed by this game. I succeeded at every hand. The music was repetitious and boring, as became the actual game. Not nearly challenging enough for me. I would have expected as the levels reached new heights, so would the difficulty of the game. Not so. There were no particular bonuses that I noticed. Not even a "wild" card. 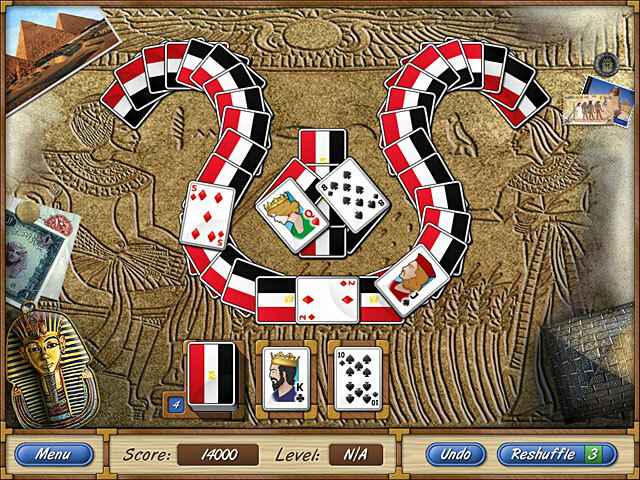 There are far more interesting and challenging solitaire games on the BF site. You just have to root them out and find them as I have. This Glam-ma says it's ok to try the game. It's only an hour and it's free. Who knows? It just might be the slow, easy cup of tea you need on a rainy Sunday afternoon. The review of this game is based on this Glam-ma's opinion - and only mine. Therefore, if you found this review to be helpful, please click on the "yes" button below. There is also a "no" button. Seriously? You'd give your Glam-ma a "no"? Kidding. Happy Gaming! 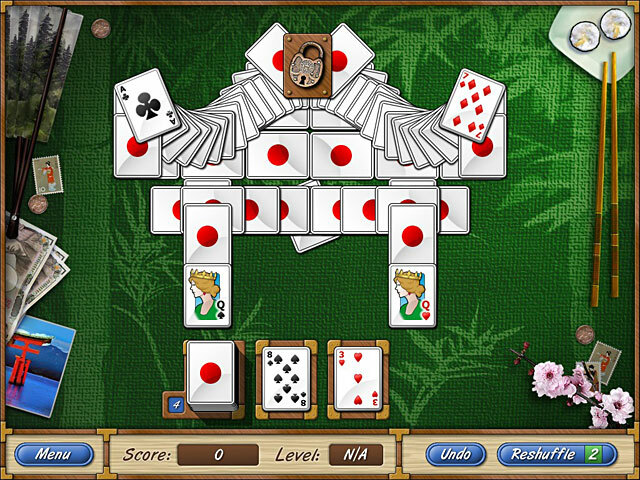 Rated 3 out of 5 by sereneorchid from A matching style of solitaire; great for kids A nice, but simple game. You match pairs of upturned cards, like sixes or jacks, until all the cards have been turned over and matched. It's a very relaxing style of play, but not very challenging, even with different layouts. A good game to wind down with at the end of the day, and an excellent way to help young kids learn their numbers. Graphics are nice. The playing fields represent different countries, and the card designs reflect the various flags. I think. Social studies was a long time ago.